Q: where do you think yields are headed to on the benchmark 10-year Treasury? I'm not a very good market timer and I'm on a very short term trader but I will tell you that interest rate in America (...) we've had very long cycles in the bond markets. Depending on how you look interest rates or bond prices started a bear market in 1946 which ended in 1981, you can tell that that's 35 years. Then in 1981 we started a bull market in bonds. Well that one is gone on for 36 years I'm 37 years. So bull markets in America anyway have had a habit of being very long. So I would just suggest you that's it's already started turning and the interest rates are gonna go up for a long long time. If I told you how high, you would hang up, you would stop listening to me. So when the next bear market comes in bonds it's gonna be a doozy. Since 2008 government debt around the world has doubled. Everybody has talked about austerity and how we're going to cut back spending and pay off the debt etcetera but the debt has doubled. The debt at the American central bank has gone up five or six times in just nine years. This has never happened before in recorded history. Never, ever have interest rates been this low and they say it's all going to be okay. You better call the Tooth Fairy. The best overall market for me is China. That is why I have moved to Asia. You don't always buy the chinese market no matter the price but it's still 40 percent below its all time high. If I'm correct, gold will go down even more and there will be another opportunity to buy it. When people lose confidence in governments and money they buy gold and silver. Maybe they shouldn't but that's what they do. 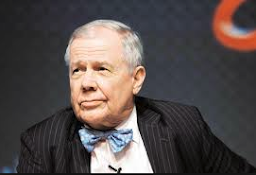 Jim Rogers shares his views on the commodity markets and on the Asian financial markets. Known reserves of oil are in decline all over the world except for fracking. The fracking buble burst, the fracking players had to slow down. Supplies are under duress worldwide for oil. Crude Oil is in the process of making a complicated bottom. Eventually we will see higher prices, maybe in 2019 or in 2020. We have certainly seen the top in the bond market, there is no question about that. Bonds will probably be going lower for years to come. There is no question that we will see higher interest rates over the next few years. In fact, interest rates will go much, much higher in the next decade. Well, agriculture has been going down over the past several years. I would consider agriculture less vulnerable and perhaps even a place to make money on the upside because things have been down for so long. Nearly all markets will be affected in the same way especially India because Mr. Modi is now coming up with a capital gains tax. So now the Indian stock market has the problem of having gone up for a long time and for a long way and now you will have a capital gains tax. India will probably be worse affected than other markets. Whenever there is an overdue stock market correction people always look for a reason. I can give you some reasons: the main reason is that it has gone up too long, too far, too fast but interest rates are also going higher and there are problems in Washington with the government. There are many reasons. But essentially it is because it went up without a correction and now we are having one. Stock markets around the world have been going up a lot in the last few years and in the U.S. for instance the stock market has not had a big correction for a long, long time. It's very unnusual what happened in the U.S. stock market, it was overdue for a rout and now we are having one. Jim Rogers explains the stock market sell-off on Bloomberg Asia. I don't think it's going to be a breakout year for gold. I still think there will be opportunities in the future to buy gold lower. It's been almost seven years since the high. Sometime in the next year or two I certainly expect for gold to make a low and then to start going higher and higher. If I was in Chinese I would say "No, I'm going to wait until I need to play the card to start selling the US Treasuries." If they need to take an action they won't have any bonds to sell. At least if they own a lot of Treasury bonds they can say to America, "If you do that we're going to sell your bonds."